Garmin Portable Friction Mount (ta-010-11280-00) | Discount GPS Accessories from mysatnav.ie Ireland's leading GPS & Sat Nav store. Portable friction mount (no installation required). 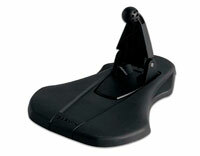 This mounting option for nüvi series, StreetPilot c5xx series and StreetPilot I series is by far and away the best overall solution as it completely portable, robust and reliable and deters any would-be thief as it does not leave any indication that the vehicle has a GPS system when the car is unattended.